LATAM Airlines Group S.A. is the new name given to LAN Airlines S.A. as a result of its association with TAM S.A. LATAM Airlines Group S.A. now includes LAN Airlines and its affiliates in Peru, Argentina, Colombia and Ecuador, and LAN Cargo and its affiliates, as well as TAM S.A. and its subsidiaries TAM Linhas Aereas S.A., including its business units TAM Transportes Aereos del Mercosur S.A., (TAM Airlines (Paraguay)) and Multiplus S.A. This association creates one of the largest airline groups in the world in terms of network connections, providing passenger transport services to about 138 destinations in 25 countries and cargo services to about 140 destinations in 29 countries, with a fleet of 355 aircraft. Sunspots Holidays offers special fares from Canada from all Canadian gateways connecting with Air Canada/USA from all gateways connecting with American airlines to South America and as well as reverse fares originating South America. We also offer special group rates for 10 or more passengers. Interested in visiting South America? Sunspots Holidays can arrange your trip with LATAM airlines, and provide you a hotel, transfers and/or tours of your choice. Please call us at 416 484 8144 and we will be happy to assist you in planning your trip. We offer destination in 37 Latin American destinations departing from Miami / USA and Mexico. 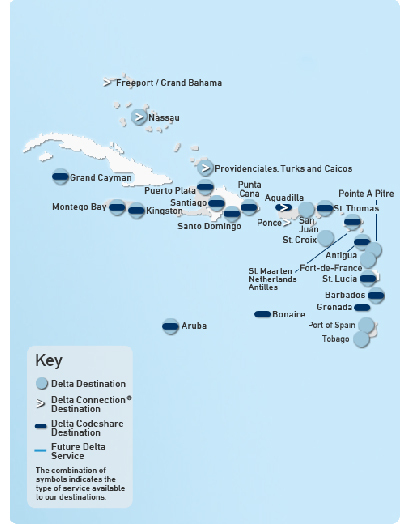 We offer to the following Delta destinations in the Caribbean. We offer 30 US Airways destinations in the Caribbean with departures from YYZ, YUL, and YOW. 2 Nights. Minimum Stay 1 Day. Advance Purchase. Our story begins in January 1974, when Campbell Travel Limited emerged as a new travel agency in Ontario. After many years of service to travellers, Campbell Travel decided to shift its focus, becoming a strictly wholesale travel company, and the new enterprise was soon known simply as Sunspots Holidays.